For a limited time, we are offering this 72 hour long term food storage kit. It has all of the food and supplies you will need to survive for three days with 2 servings per day. It is all packaged in our Elite Multi-pocket Hikers Backpack. The kit includes the following: Food and Water: The food and water in this kit will comfortably provide you with adequate nutrition for 72-hours without access to additional supplies. These products have a 5 year shelf life. 12 servings of cook in pouch meals: (2) Cheesy Lasagna (2) Chili Macaroni (2) Pasta Alfredo (2) Creamy Pasta and Veg (2) Teriyaki and Rice (2)Savory Stroganoff 24 oz. Water Filtration Bottle Light and Communications: In the event of a power outage caused by disaster you’ll have independent access to your own means of lighting and communication with the outside world. Dynamo 4-in-1 Radio Flashlight Box of Waterproof Matches Shelter and Warmth: These supplies will provide protection from outside weather forces. They will protect you from wind, sun, rain, and many other conditions you may encounter. 2 Emergency Survival Sleeping Bags Tools: These items are designed to be useful in disaster situations. They will be a valuable resource when you find yourself faced with navigation, transport, personal protection, or shelter troubles. Portable Cooking Stove (includes Fuel Tablets) Steel Fork, Knife, & Spoon Chow Kit 16 oz Steel Cup Pair of Leather Palm Work Gloves 2 Infectious Waste Bags All of our kit items are packed securely in a resealable, waterproof storage bag Hygiene and Sanitation: When in a disaster situation it is useful to have access to hygiene products. Staying clean can protect against infection, disease, and depression. 3 Pocket Tissue Packs First Aid: These first aid items can assist with minor injuries and protect against serious health concerns in disaster circumstances. 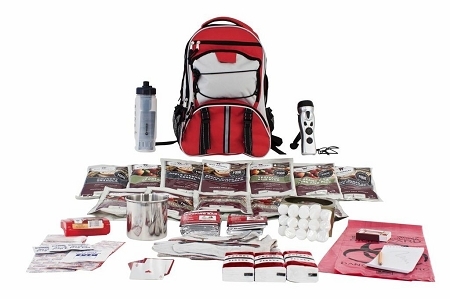 Guardian 65 Piece Deluxe First Aid Kit Other: These items are useful for stress relief and activity in strenuous or challenging circumstances. Deck of Playing Cards Note Pad Golf Pencil Emergency Survival Kit Information: This Long Term Food Storage Essentials Survival Kit was designed using advice from experts in the emergency preparedness industry. It follows guidelines given by government agencies and non-profit preparedness organizations. This survival kit has a retail value of $220.